At its first meeting of FY2015, held on April 21, 2015, the JMA Board reached a decision to implement a membership fee exemption program for physicians in residency, effective as of FY2015. This decision was based on the Proposals for Organization Enhancement for JMA, finalized by the JMA Review Committee for Organization Enhancement (Chair: Akita Prefectural Medical Association President Tasuku Oyamada) in March 2015. The future of Japanese healthcare is in the hands of physicians in residency, and this decision is intended to convey that JMA welcomes their active involvement in working together. Specifically, the Board decided to waive the annual membership fee (6,000 yen or approx. USD 50) for physicians in residency regardless of whether or not they purchase JMA Professional Liability Insurance. Their subscriptions to the printed versions of the JMA News and the Journal of Japan Medical Association [in Japanese] will be changed to electronic subscriptions through JMA Lib online. JMA started the Support Project for Physician-led Medical Equipment Development and Business in June 2015 to promote medical equipment development and business opportunities based on physicians' ideas inspired by their daily practice. Many ideas were submitted by physicians from university hospitals or research institutions, as well as from those in private practice, and seminars have been scheduled for 2016 across Japan to introduce cases in progress and to collect more inputs. The Dalai Lama gave a lecture to Japanese physicians in the hall of the JMA Building on April 4, 2015. After the lecture, a rhododendron sapling was planted by the front entrance of the building in commemoration of his visit. During the lecture, the Dalai Lama described medical professionals as individuals who remove people's suffering and serve for the people, like the Bodhisattva. He also said that a heart of compassion in addition to knowledge and skills produces the perfect form of medicine, and requested that patients be treated with compassion. To further enhance and strengthen the ideal shape of the faculty for Kakaritsuke physicians, JMA decided to launch the JMA Kakaritsuke Physicians Faculty Training Program at its 7th Council Meeting, held on October 20, 2015. The program is expected to start in April 2016. The prefectural medical associations will be in charge of implementing the program. JMA will design a standardized training program and support the prefectures in strengthening kakaritsuke physicians. 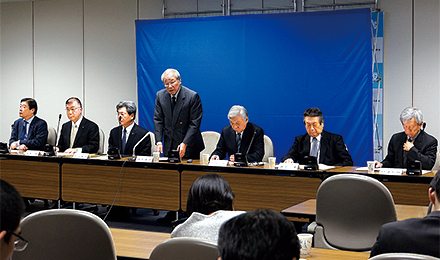 On August 6, 2015, JMA and the prefectural medical associations were designated as Medical Accident Investigation Support Organizations; as such they provide consultation in judging medical accidents and advice on investigation methods. This designation was made to prepare for implementation of the Medical Accident Investigation System, effective as of October 2015. JMA Medical Accident Investigation Cost Insurance was also established in October 2015 to reduce the economic burden on JMA members and to allow full in-hospital investigation for the benefit of the bereaved. After many review sessions, the Joint Committee for Physician Maldistribution Resolution Review, established by JMA and the Association of Japan Medical Colleges (AJMC), finalized and announced urgent proposals on December 2, 2015 to resolve uneven distribution of physicians by region and area of medical practice. The proposals comprise 5 main points, namely: 1) Establishment of a career support center for physicians, 2) Promotion of clinical training for physicians-in-training in the vicinity of their medical schools, 3) Introduction of a prerequisite for hospital/clinic managers to have worked in areas suffering from shortage of physicians, 4) Understanding of regional demands and demands in each area of medical practice (primary specialties), and 5) Reduction in medical school admissions quotas and suspension of new medical school approvals. 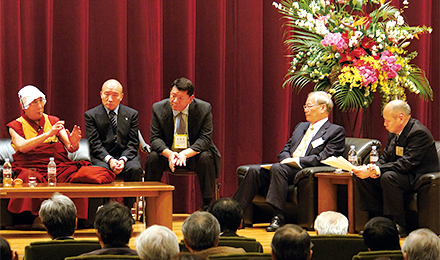 JMA President Yoshitake Yokokura was inaugurated as a member of the Central Disaster Prevention Council—specifically, as representative of the Disaster Victims Health Support Liaison Council—on June 9, 2015. At the press conference held on June 17, President Yokokura shared his awareness of being entrusted with this important duty and expressed his determination to prepare for the next large-scale disaster by bringing together relevant domestic organizations in healthcare, medicine, and long-term care. 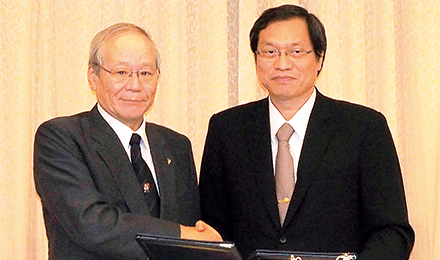 On July 30, 2015, JMA President Yokokura and Executive Board Member Masami Ishii visited Taiwan to conclude agreements between JMA and the Taiwan Medical Association (TMA) and the Taiwan Root Medical Peace Corps (TRMPC), respectively concerning the dispatch of physicians and systems for medical relief assistance in disaster situations under mutual consent. Prior to this, JMA dispatched a team of physicians—the Joint Burn Care Assistance Team of Physicians by JMA and 3 Medical Societies—to assist in caring for burn victims of the accidental dust explosion in June at a theme park in Taiwan. On November 12, at the 68th Annual National Doctors' Day Celebration in Taiwan, Taiwanese President Ma Ying-jeou expressed his gratitude for these relief efforts, and a letter of appreciation was presented from TMA to JMA Executive Board Member Sadaomi Imamura, attending the event on behalf of President Yokokura. JMA and the Japanese Association of Medical Sciences (JAMS) jointly developed the Medical Care Guidelines for Post-HPV-vaccination Symptoms, which provides treatment options for patients who develop symptoms after receiving an HPV vaccine. 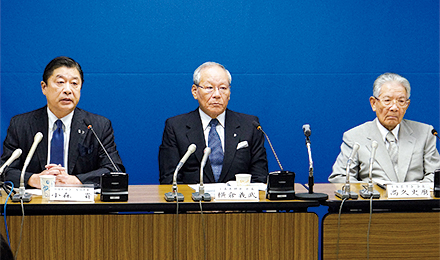 At the press conference held on August 19, 2015, President Yokokura, who appeared with JAMS President Fumimaro Takaku, expressed his hope that the Guidelines will be used widely by physicians to help provide proper care for patients. Kakaritsuke physicians often deal with dementia patients in their daily practice. 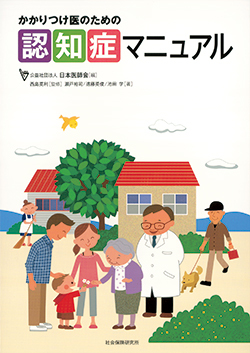 JMA has developed the Dementia Manual for Kakaritsuke Physicians to further promote physicians' understanding of this disease. The Manual provides tips and instructions, including risk management for prevention, disease control, points to note when seeing and caring for patients, and examples of how to fill out the patient referral document forms.